Hitler, flush with victory over France, now demanded to see plans for the invasion of Switzerland. His rage knew no bounds, as the head of OKH Franz Halder recalled: “I was constantly hearing of outbursts of Hitler’s fury against Switzerland, which, given his mentality, might have led at any minute to military activities for the army.” Within hours of the French capitulation, Captain Otto Wilhelm von Menges in OKH submitted a draft plan for the invasion. Generaloberst Wilhelm Ritter von Leeb’s Heeresgruppe ‘C’ (HGr. C), led by Generalleutnant Wilhelm List and the 12th Army would conduct the attack. Leeb himself personally reconnoitered the terrain, studying the most promising invasion routes and paths of least resistance. Menges’ plan called for a pincer movement from German troops in France and Germany focused on taking Bern quickly, with Italian divisions invading from the south. Speed was critical: the plan’s primary objective was to seize the industry in the Solothurn area and capture the railroads, bridges, and transportation infrastructure across the Alps intact. The plan committed the 12th Army, with three army corps and an independent division (the 12th Mot. Infantry). The SS-“Totenkopf” and 23rd Infantry divisions were kept in reserve, along with a brigade of Fallschirmjäger airborne troops. The three Army Corps, the XV, XVIII, and XII, contained between them 7 infantry divisions, 1 Panzer division, and 1 division ofGebirgsjäger mountain infantry. In addition to 12th Army,Panzergruppe ‘Guderian’ was to be used in the attack – with four panzer divisions and two infantry, his forces were primarily to blitz towards Bern, and capture it before the Swiss could fully realize what was going on. In total, the plan was to make use of 15 divisions. As Menges noted in his plan (and all subsequent drafts authored by him), he believed that the Swiss resistance was unlikely and that a nonviolent Anschluss was the most likely result. With “the current political situation in Switzerland,” he wrote, “it might accede to ultimatum demands in a peaceful manner, so that after a warlike border crossing a rapid transition to a peaceful invasion must be assured.” The political situation he was referring to was the weak-kneed vacillations of the Federal Council. Swiss morale was at an all-time low. Despite the looming threat, the Federal Council assumed that with the Battle of France concluded and an armistice signed any immediate danger had passed. The Swiss Army began demobilizing, with a target size of 150,000 men. Federal Councilor Marcel Pilet-Golaz, after consultation with the rest of the Council, made a radio address on June 25 in which he announced the demobilization and warned the Swiss that they would soon have to play a part in a Europe “very different from the Old…and to rely on other foundations.” He made ominous references to the coming “major decisions,” “recovery,” and the breaking of “ancient habits.” His speech was compared to those coming from the newly-minted Vichy regime. 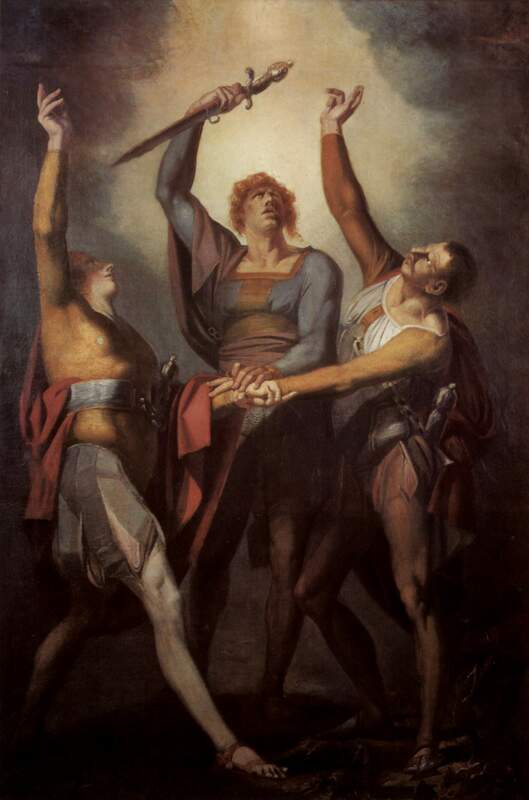 Johann Heinrich Füssli’s “Die drei Eidgenossen beim Schwur auf dem Rütli” (The Three Oath-takers of the Oath of the Rütli), 1780. Here, soldiers of 1940, we will inspire ourselves with the lesson and spirit of the past to envisage resolution of the present and future of the country … Currently there are, beyond our borders, more troops – and excellent troops – than ever before. We can be attacked on all fronts at the same time, which was not really conceivable a few weeks ago. The army must adapt itself to this new situation and take a position that allows it to hold on to all the fronts. It will thus fulfill its invariable, historic mission … In Europe, for a long time to come, millions of men will remain under arms, and as long as considerable forces can attack us from one moment to the next, the army must and will resist. The speech was precisely what both the officer corps – and the nation – needed to hear. Coming a month after the Pilet-Golaz address, and by taking the potentially dangerous step of putting his entire officer corps on a single boat to get to the Rütli, Guisan was, as usual, taking huge risks – which resulted in an equally huge payoff. Portions of it were broadcast on the radio and printed in newspapers. Even the Germans were impressed. The German envoy in Bern reported to Berlin on its “surprising declarations.” The orders “warned against the dangers of defeatism and reminded those in the audience to believe in their own strength with which Switzerland, with an iron will, would successfully offer resistance … The Envoy suggests that the Axis powers register a complaint with the Swiss government.” As usual, no one paid him much attention. Nevertheless, German preparations for invasion – and the Swiss for resistance – were moving straight ahead. The original Menges plan was now outdated, and so after a slight revision, he wrote a new version of it and submitted it to OKH on August 12. 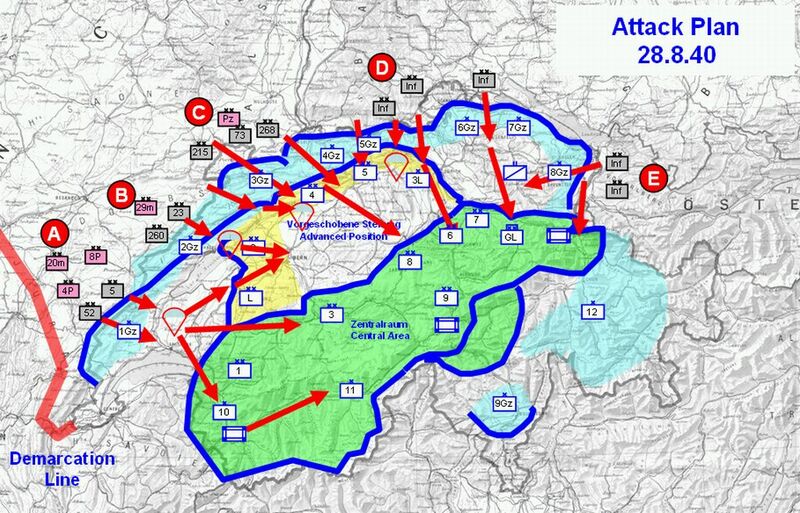 Since the original plan was compiled in June, the Swiss Army’s manpower had been halved due to the partial demobilization. During the Battle of France, roughly 42,000 Polish and French soldiers had retreated across the border and were now in internment camps in Switzerland, where they continued to train. As Menges observed, when the Germans invaded, they would surely be released to fight on the Swiss side, but for the time being, guard duty occupied one-and-a-half Swiss divisions in the south, away from the proposed direction of attack. The new plan was a concentric attack by the Wehrmacht from the north and west, linking up with the Italians invading in the south. Once again, 12th Army would lead the assault, though now without the aid of Panzergruppe Guderian. The plan was merely referred to as “Fall Schweiz” (Case Switzerland). Guisan’s Réduit National had been put into effect as an order issued July 17. A drastic, desperate plan, it made military sense, but was risky politically. The most favorable defensive positions were of course, the Alps, but by abandoning the major cities and population centers, the Swiss were in effect leaving 80% of the Swiss population at the mercy of the Germans. All of Swiss industry and indeed, a large swath of the national heritage (including the Rütli) would be left behind. Operationsbefehl Number 11 served as preparation for that idea, and didn’t define a new defense pattern except to say that “the development of the general situation and its consequences on our borders require a deep change of the current position of the army.” For the time being, this mostly consisted of a shifting divisions to the Zentralraum (Central Area), which would serve as the redoubt and last stand for the Swiss Army. Switzerland’s greatest defensive strength lay in the terrain, and its fortifications played to this, embodied in the Redoubt concept. From Vallorbe on the French border, to Basel west of Neuchâtel, and on to Konstanz and the Bodensee, the border was heavily armed with a series of fortifications aimed primarily at choking off the narrow valley passes. Op. Bef. 12 divided the country into three tiers. The immediate border areas were heavily fortified but lightly defended. Their mission was mainly to fight a delaying action while full mobilization took place, and the recalled units assembled in the Redoubt. The Vorgeschobene Stellung (Advanced Position) consisted mostly of the interior plains and was home to Luzern, Bern, Fribourg, Thun, and at its northern-most point, Zurich.To the rear, bounded by the Rhine, was the Central Area, home to the National Redoubt and Guisan’s headquarters. It was here the Swiss would fight to the last. Ten days after Op, Bef. 12 was issued, more than 56 percent of all guns, and 76 percent of the heavy guns (105-150mm) were positioned in the Redoubt, along with 42 percent of the antitank weapons. The Army now contained 8 full divisions (including an ad hoc light infantry division) and 15-20 independent battalions. Half of all Swiss troops had taken up stations in the Redoubt, and stockpiles of small arms, ammunition, and foodstuff had been gathered to last for at least two months. Militarily, though, it was a near-flawless plan. It contained 12 artillery forts and was constructing 19 more, while positions were also to be found for the older 75mm guns without a home. The mountain passes were bristling with artillery, with nearly 100 pieces stationed in the fortresses at St. Gotthard, St. Maurice, and Sargans alone. Aside from the near-universal partisan resistance that could be expected in the cities and plains, the National Redoubt would be a tough nut to crack. While the second draft of the Menges plan would serve as the basis for all subsequent ones, Halder believed it did not give enough credit to the Swiss (Menges had concluded that the Swiss Army was “suitable only for defensive purposes and completely inferior to its German counterpart”). On August 26, only two weeks after the previous draft, OKH ordered a new study conducted, with the assumption that “Switzerland is determined to resist an invasion with all its might,” and with 12th Army to lead the attack. Leeb passed the order on to List, whose general staff submitted a fresh plan on August 27. For the first time in the war, it was given an operational name:Fall Grün (Case Green). 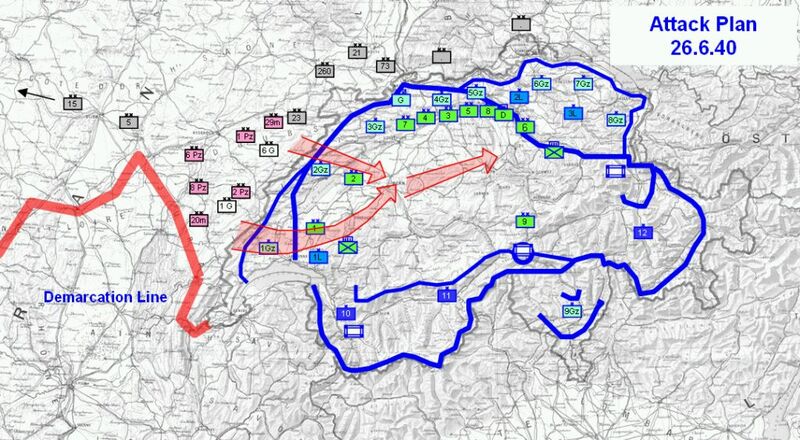 Fall Grün was a return to the pincer movement centered on Bern, and now featured Fallschirmjäger units dropped directly into the St. Maurice area, and a spearhead of infantry directly towards the Sarfgans Fortress. This plan was approved by HGr. 12, but appears to have never made it to OKH. Nevertheless, on August 28 Leeb approved the plan as operational doctrine for the foreseeable future. On October 4, 12th Army sent a reworked plan to HGr. 12. It was now known as “Operation Tannenbaum.”Leeb had planned this draft with the expectation of 21 divisions committed to the assault. OKH returned the plan with a downward revision of these figures to only 11 divisions needed. Halder himself had studied the border areas, and concluded that the “Jura frontier offers no favorable base for an attack. Switzerland rises, in successive waves of wood-covered terrain across the axis of an attack. The crossing points on the river Doubs and the border are few; the Swiss frontier position is strong.” He decided on an infantry feint in the Jura in order to draw out the Swiss Army and then cut it off in the rear, as had been done in France. He sent back Tannenbaum with the divisional requirement cut from 21 to 11. Still, with roughly 15 Italian divisions prepared to enter from the south, the Swiss were looking at an invasion by somewhere between 300,000 and 500,000 men. They figured they could take as many as 200,000 with them. Additionally, it has to be assumed that the Swiss would have enacted the worst-case scenario for the Germans: blowing the Simplon and St. Gotthard Pass tunnels into Italy. The passes were mined and prepared for immediate demolition, and a full 16,000 Swiss soldiers were detailed to that task.The Germans had anticipated this in their planning, and were ready to use the Napoleonic-era roads over the mountains to transport artillery. This very well could have been the pattern in the rest of Switzerland. While Guisan had rejected the idea of a total scorched-earth policy, who could say what the average Swiss would do? The partisan warfare would be vicious, the German reprisals brutal, and Switzerland might well have had one of the most active and effective resistance movements in occupied Europe. All in all, German attention soon turned towards planning OperationSeelöwe (Sealion, the German invasion of Great Britain), and on November 11, OKH declared that an operation against Switzerland was no longer ‘urgent.’ The fluid priorities of Hitler meant that even Sealion was soon cast aside in favor of Operation Barbarossa. Pingback: links for 2010-04-19 at Links. Historische.